Growing up, the newspaper was a more popular item to bring home than a loaf of bread for our family of five. Each morning brought us the most recent edition of Newsday, Long Island’s leading news source. I wondered why we always had the newspaper and why someone would want to read through it day in and day out, like clockwork. Eventually the mystery was solved for me. My dad, Timothy Oscher, is a pressman for Newsday. He works overnights and prints the newspaper for the following day. That is why we had a complimentary newspaper at our house every day, since before I was born nearly 21 years ago. I would watch my dad at the dining-room table with his coffee, reading the paper from cover to cover … but I never understood how or why he would do this. Slowly but surely, I picked up his love for newspaper without even realizing it. I found myself reading the “Help Wanted” ads even though I was too young to work. This led to the “Cars for Sale” section, where I could dream of what would be my first car. I loved reading highlight stories about the successes of local everyday people and also keeping up with Long Island’s own personal train wreck — Lindsay Lohan. Having the newspaper in my life since the beginning has sculpted my view and appreciation for print. I love having the hardcopy of anything, whether it’s a book, including expensive textbooks for school, or a syllabus for class or invitations to events. As much as I love technology and the advances that continue to develop, I will forever be loyal to the print copy of anything. There’s just something about the physical copy that gives meaning to whatever is printed on it. Print has long been important in history — from political communication and official legal documents to original copies of books — and will continue to be valued, no matter how far we go into the digital world. 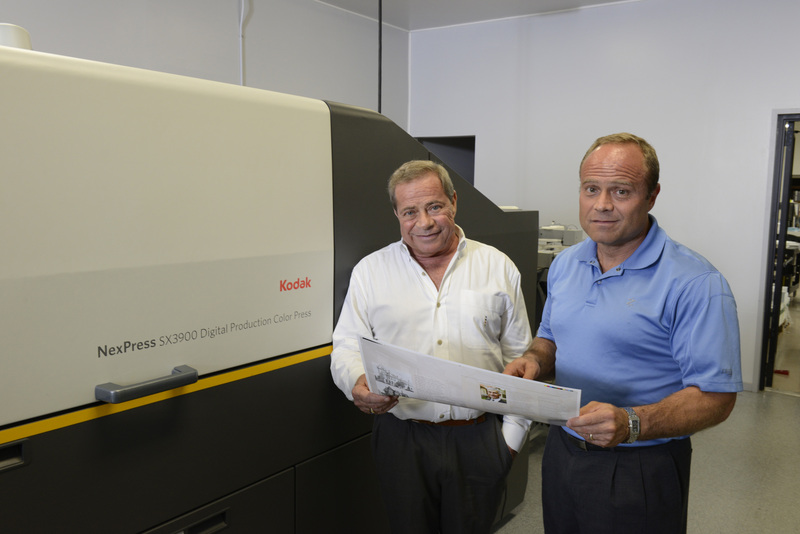 Skip DeBiase and his son, Sal, review a color document from their Kodak Nexpress SX3900. 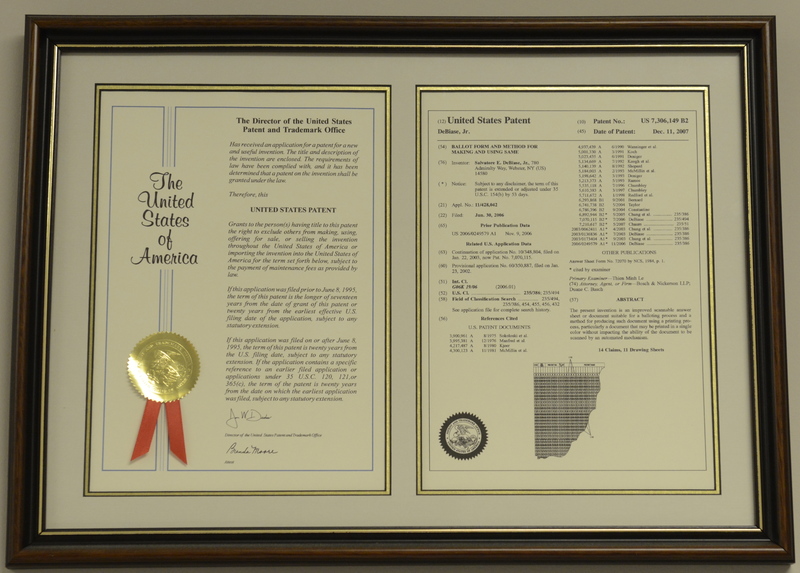 I am proud to tell our customers that we are a four-generation printing business. I personally have grown up in the printing industry. Working in my mother and father’s “family-run” print shop after school, learning and living not only the technical side of printing but also the physical side of having the work ethic necessary to grow and survive the business. I personally have been on the job watching, learning, and growing with the dramatic changes I have lived through from my front-row seat during my 55 years in the industry. I have lived through the evolution of “movable type” letterpress and hot metal linotype to “cold composition” and offset lithography to the advent of the computer era and up to present — the digital revolution in printing. The changes even amaze me! A full-color product in the 1960s meant my father and I would color separate, strip, plate, and run the 4-color process on a 1-color press, one color at a time. The sequence was run yellow separation first, then put the sheets back through the press and run the red separation (while staying in perfect register of dot for dot), and again for the blue separation, and finally the black plate. Throughout the four separate runs, there was much anxiety as we never knew if the final finished piece was acceptable until the final pass was complete — and if it wasn’t perfect, we would throw it out and start all over again at our expense. The problems could have been in the original film separations, the stripping (aligning), the plate (exposures), or the press (inks, densities, registrations, offset, etc.). Over the years, we ultimately experimented and changed combinations, but no matter, it was not an exact science as we were working with so many variables (films, plates, inks, presses, washes, registrations and so on). In retrospect, I don’t know how we made it work, but we did somehow. In the 1970s we increased our color work by investing in 2-color presses. When we did that, we could put down various combinations with only two passes of each sheet. We could “see” the final image much sooner and had more latitude in altering the overall image by adding or subtracting two colors at once. Sequences became blue black then red yellow. This gave us a much greater ability to manipulate the final color densities of the image produced. Today it seems archaic, but at the time we honestly believed, “Wow, we’ve arrived! In truth the industry kept evolving at a much faster pace than ever imagined. We expanded to web offset (roll-fed), multi-unit presses, whereby we printed four or even five colors with one pass through the press. At the same time, the “web” of paper was automatically cut off and sheeted or, if needed, folded as required for final usage. Just as time marches on, so it is with the printing industry. Offset (lithography) is rapidly being replaced with digital printing. The new digital world allows us to do things that were not even considered a few years ago. As it’s computer-generated, each piece can be individualized. Gone are films, plates, stripping, etc. What used to take us a week to make ready can now be produced and completed in hours. Currently we have reached the pinnacle of digital color printing with the Kodak NexPress SX3900, which we installed in 2014. This goes alongside our other 10 Kodak digital presses. Being in Kodak’s town, and having their technical staff always available, certainly helped make our equipment decision easier. 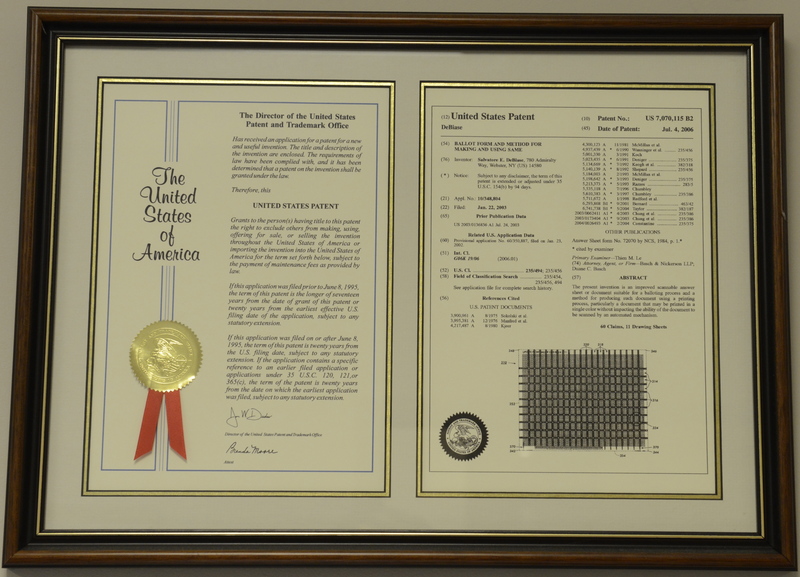 We used to produce thousands of documents in decades past, whereas we now produce tens of millions of documents in the same time frame. What used to take weeks, literally now takes hours. This allows our customers much more flexibility in ordering on as-needed basis. This new technology has truly been a game changer on both sides of the aisle. 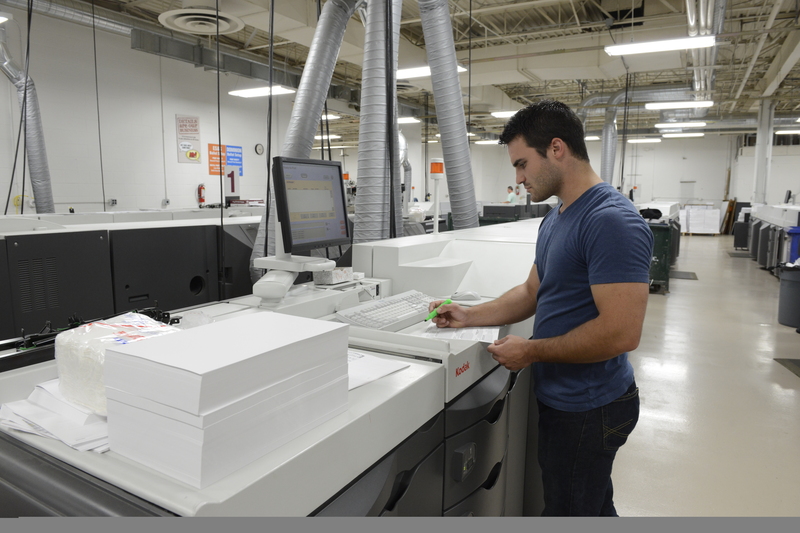 Phoenix Graphics has 10 digital color Kodak presses working alongside its Kodak NexPress. Our family business still thrives due to the work ethic instilled by our ancestors. It has grown from a small hand-fed press in my father’s basement — where he printed church bulletins and prayer cards — to the multi-million-dollar commercial powerhouse it is today. I have grown from running that hand-fed press at age 12 to overseeing the staggering growth of Phoenix Graphics as it exists today. I am in awe of the capabilities our latest equipment allows and feel a great sense of pride watching the evolution and the next generation that is the driving force moving forward. There’s no room for error when it comes to ballot printing for election season in New York State. For us at Phoenix Graphics, elections are an incredible opportunity to exemplify our unfaltering commitment to precision and detail. We highly value our local, regional, and statewide communities’ civic voices, and have made it our mission to produce the highest quality voter materials for each and every one of the 13,000 election districts we serve (over 75% of New York State). Election laws are complex. In order to better adhere to the intricacies of each county’s respective ballot requirements, Phoenix got creative. We’re proud to say we’re the first commercial printing company in New York State to develop software specifically designed to facilitate precise ballot formatting, thereby accommodating complex NYS requirements. Each election year presents new challenges, and we continually look forward to utilizing our knack for innovation and creativity to accept each challenge and reach our goals. Thank you, New York State, for entrusting us with this paramount opportunity, and we look forward to providing you with your election materials for many years to come!